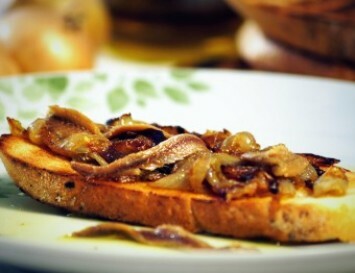 The only challenge in preparing this bruschetta is the time to caramelize the onion. Be patient. The darker it gets, the better its taste. Peel and slice the onions. Place them in a skillet with some olive oil and sauté on low heat until fully caramelized, for about 30 minutes. Season with little salt. Arrange freshly toasted bread slices on a serving platter or individual plates. Distribute the caramelized onion with all of the oil from the skillet between the bread slices. Garnish with anchovies. Serve warm. Sprinkle with some freshly ground black pepper.